The decision of the FCA in Bauer v Easton illustrates the deficiencies of the essential elements doctrine in claims construction.1 In principle the doctrine can sometimes rescue a patentee from a poorly drafted patent, but in this case it did not, and in general it is extremely difficult to predict how it will be applied. I suggest that it needs to abandoned entirely, or reinvigorated with a clarified version of the Improver questions, as discussed in my article, “The Essential Elements Doctrine in Patent Infringement" 22 IPJ 223, (draft version here.) As it stands, the doctrine adds complexity and reduces certainty, without offering more than a faint hope to a patentee with imperfect claims. The doctrine is important when a claim includes an element that is not necessary to the patentability of the disclosed invention. If the element in question is “essential” a competitor can copy the inventive concept without infringing; conversely, if the problematic element is not “essential,” a defendant who copies all of the remaining essential elements will infringe the claim, even though its embodiment does not include the element in question. The dilemma in such cases is that if the court finds the element to be non-essential, it is in effect re-writing the claim by ignoring that element in determining infringement, but if it finds the element to be essential, it is allowing the competitor to freely take an invention that was invented and disclosed by the patentee. There is no easy way out of this dilemma. The Improver questions purported to offer a test, but that approach has not been applied in Canadian cases, despite its endorsement by the Supreme Court in Free World 2000 SCC 66 -, and in the UK they have been repudiated by Lord Hoffmann himself as a “mangle” in Kirin-Amgen  UKHL 46 . 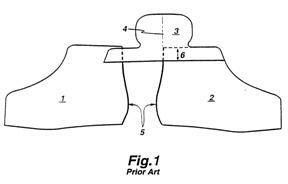 The issue is best illustrated by the decision of Thorson P in McPhar Engineering Co. of Canada v. Sharpe Instruments Ltd., [1956-60] Ex CR 467, 35 CPR 105. (While the Supreme Court decisions in Whirlpool 2000 SCC 67 and Free World are the leading Canadian cases, the discussion of principles in those cases is not a clear as might be desired, and both decisions are problematic in their application of the law to the facts.) The invention in McPhar was a portable electromagnetic transmitter to be used in prospecting for conductive minerals. For such devices to work, the generator driving the transmitter had to run at a stable frequency. In the prior art the frequency was stabilized by using a relatively large generator with the motor throttled back so that a governor could be used. The drawback was that the large generator impeded portability. The patentees' inventive concept was that frequency could be stabilized by loading the generator with the transmitting coil itself ("load control"). This concept, which was a radical departure from the prior art, solved the problem of portability. At the same time, it was well known in the prior art that in order for any electromagnetic prospecting device to work effectively the transmitting coil had to be positioned vertically. The most convenient means of achieving this was to suspend the coil to hang freely from above, allowing gravity to hold it in the vertical position. The claim therefore specified a transmitter using load control and a “means to suspend said transmitting coil to hang freely in a vertical plane.” In the defendant’s device the coil was fixed to a base plate that was leveled with adjustable screws. Thorson P held that it was impossible to construe “hang freely” as encompassing a coil that was fixed rigidly. Thorson P therefore faced a choice between re-writing the claim to ignore the element “hang freely,” or allowing the defendant to copy the revolutionary inventive concept from the patentee. For all the fanfare, purposive construction, à la Catnic,  RPC 183 (UKHL), does not solve the problem. Catnic was an easy case, in the sense that it did not stretch the text very far to construe "vertically" as meaning sufficiently close to vertical to perform the load bearing function. This does not help in hard cases, such as McPhar, in which no reasonable interpretation of the text is broad enough to include the defendant’s device. In that case, the problematic element must be ignored, or the defendant’s device will be held not to infringe. In McPhar, Thorson P held that the requirement of hanging “freely” was not essential, so that the defendant’s device infringed. However, this outcome is by no means assured, as Bauer v Easton illustrates. Bauer v Easton is also a hard case. 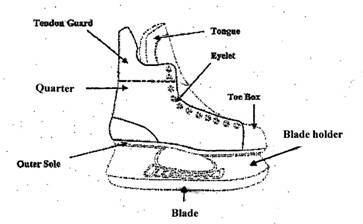 Skate boots, such as hockey stakes, normally comprise a quarter and a tendon guard. In the prior art the quarter was made in two pieces, a left and right half, which were sewn together. This resulted in manufacturing difficulties and a weaker skate. 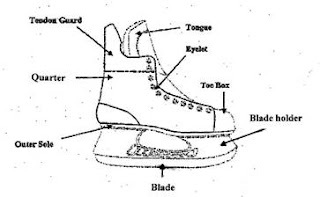 The patentee developed a skate boot with a one piece quarter. This was a substantial improvement over the prior art. In order to make a complete boot, it was necessary to attach the quarter to the tendon guard. Two methods of doing this were known in the prior art: side-by-side attachment, and overlapping attachment [FC 231]. The claim specified “side–by-side” attachment (see claim 1, FCA ). Side-by-side attachment had certain advantages, but both methods had been used in the prior art, and even the defendant argued that the inventive concept lay in the one piece quarter [FCA 23]. (The defendant made this point in order to support its argument regarding obviousness.) A first reading might suggest that this was a case like Catnic, where it would not stretch the language unduly to hold that “side-by-side” includes a slightly overlapping construction. However, it was clear on the evidence that “side-by-side” and “overlapping” were two known methods that were understood in the art, so a posita would understand “side-by-side” as contrasting with overlapping construction. Thus this is a hard case, in which the one-piece quarter corresponds to the load-control in McPhar, and the method of attaching the tendon guard corresponds to “hanging freely." At trial, Gauthier J held that the side-by-side construction was an essential element [FC 143] and consequently certain of the defendant’s models did not infringe [FC 172]. The Court of Appeal affirmed [FCA 51], notwithstanding that this allowed the patent to be easily circumvented [FCA 52]. Bauer v Easton may distinguished from McPhar in certain respects. In particular, the disclosure extolled the advantages of the side-by-side attachment in terms of savings of weight and material (p.1 26-28) and specified the objective of the invention in broad terms as being for “an improved quarter” and a quarter avoiding “the above mentioned drawbacks,” where “above” included the weight savings of the side-by-side method. Also, the fact that the overlapping construction was well known in the prior art may be taken to imply that the drafter specifically excluded it. This is in contrast to McPhar; while using a fixed plate with adjustment screws was not inventive, hanging the coil freely was the only method generally used in practice, as a fixed plate was less convenient and less effective. However, while these points are relevant, and may well explain the different result, they are not so strong as to compel Gauthier J’s conclusion. Thus the broader lesson is that the essential elements doctrine is at best uncertain in its application. Further, it must be recognized that in any case in which the doctrine plays a substantial role, the claim will have been poorly drafted, in the sense that it would have been possible for the patentee to have drafted a valid claim that encompassed the infringing device. In McPhar the claim might specified “means to orient said transmitting coil in a vertical plane.” In Bauer v Easton, as the Court of Appeal pointed out  “the patentee could have referred to both methods of attachment. 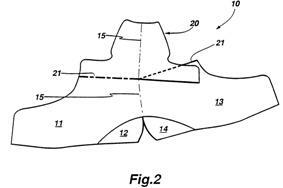 Alternatively, claim 1 could have been drafted by stating that the tendon guard “may” be secured in a side-by-side fashion or simply that the tendon guard is “secured” to the quarter without reference to either method.” Because of this, the easiest way out of the dilemma is for the court to interpret each element as being essential, so justifying the result as a “self-inflicted wound.” This approach has the sanction of the Supreme Court in Free World , and was repeated by the Court of Appeal in Bauer v Easton . Certainly this approach has the merit of simplicity. The essential elements doctrine as it now stands cannot be counted on to aid a patentee whose claim is poorly drafted. It is time to either reinvigorate the doctrine, with a more robust application of the Improver questions, as I suggest in my article, or to seek the advantage of simplicity, and abandon it altogether.